Despite laudable efforts and success in reducing tobacco use and its associated burden in Vermont over the past several decades, tobacco use remains considerable. Currently, an estimated 81,000 Vermont adults smoke cigarettes and significant disparities in tobacco use and burden exist among Vermonters (e.g., individuals with lower education and income levels, mental health and substance abuse issues; pregnant; racial and ethnic minorities). 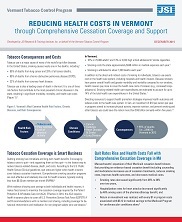 With a new cooperative agreement from the CDC, the Vermont Tobacco Control Program (VTCP) will implement a multi-component approach of state and community interventions, mass-reach health communication interventions, cessation interventions, surveillance and evaluation initiatives, and infrastructure, administration, and management capacity to advance tobacco control in Vermont over the next 5 year project period (2015-2020). Program evaluation is a core component of the VTCP and a requirement of their CDC cooperative agreement. In March 2015, the VTCP contracted with JSI to provide evaluation and technical assistance services. Guided by the CDC Framework for Program Evaluation and the socio-ecological model, JSI will involve VTCP staff and stakeholders throughout all phases of the evaluation planning, implementation, and reporting activities. 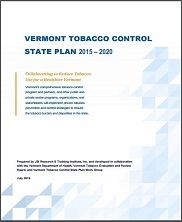 JSI will provide the Vermont Tobacco Control Program (VTCP) evaluation and technical assistance services as part of their CDC cooperative agreement (2015-2020). 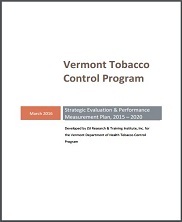 JSI will develop a 5-year strategic evaluation plan for the 2015-2020 project period; provide technical assistance and planning services for stakeholder engagement, communication, and data use and dissemination strategies; and evaluate the VTCP’s Tobacco-Free State-Funded Behavioral Health Centers Initiative and the Medicaid Tobacco Benefit Expansion and Promotion Initiative.